Recommendation: Highly Recommended to all armor fans and guys who love BIG models! The T-35 was developed in early 1932 and two different prototypes were built under the direction of N.V. Barykov. They were based on the British “Independent” and had a total of five turrets: two machine gun turrets to engage troops, two 37mm antitank guns, and a 76mm howitzer for the destruction of engineer works and other targets. Each of the gun turrets also had a machine gun, for a total of ten weapons for the tank. But it was underpowered and clumsy, so a redesign was ordered. Barykov’s shop became the Prototype Factory for Special Machinery, but was told to transfer all of the plans and technical details plus the prototypes to the Khar’kov Locomotive Works or KhPZ. They built the modified vehicle, now called the T-35A, and after a short developmental period began limited production of the tank in 1934. 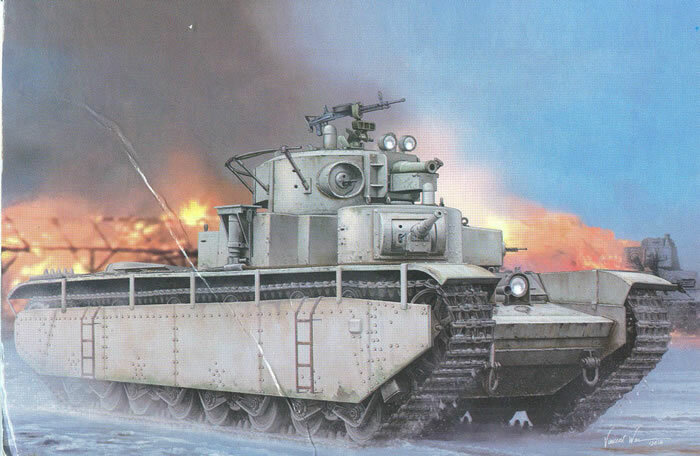 Between 1934 and 1939 they built a total of 59 tanks, which with the first two prototypes, made a grand total of 61. While it was known officially as the T-35, the production tanks changed the 37mm guns for the 20-K 45mm tank gun used in the BT and T-26 series tanks. The tanks remained pretty much the same until first a P-40 ring mount with an antiaircraft machine gun was added about 1936 and then 1938 when a new gun and conical turrets similar to those used on the BT-7 were used to replace the flat-sided Leningrad designs. The tanks equipped a powerful tank brigade, the 5th (later 14th) in the Kiev Military District. The tanks were later divided up into two regiments, the 67th Heavy Tank Regiment and the 68th Heavy Tank Regiment of the 34th Tank Division, 8th Mechanized Corps. a single example of the T-35 survives today, and this is a star at the Museum of Armored Vehicle Technology at Kubinka. Hobby Boss has now released THREE kits of the T-35; an early production tank with plain turret roof, KT-28 gun and early turrets (83841); a 1936 vintage tank with the P-40 antiaircraft mount and star cast in the turret (this kit, 83842); and a 1939 tank with conical turrets and L-10 gun (83843). All share most of their parts and only the detail differences are substituted. Make no mistake about it - the T-35 is a BIG tank and this is a big kit. The kit comes with the central hull tub and hull roof partitioned off from the rest of the parts but both are nicely detailed and molded. But since all three kits share the same basic moldings, the directions are quite finicky about what has to be cut, removed or added and drilled out. You will have to pay close attention and check the parts as often they say “remove” and just point at the hull. While the model comes with a huge number of additional brass rivet and bolt heads the nice thing is that it does not seem that they are needed with this kit! At least they include 132 spares on the suspension sprues to replace any sanded off during construction. Each bogie (there are eight) consists of 18 parts including four etched brass drag struts but are quite complete. In point of fact, in case you want to show them off (as they are completely hidden under the skirts on the side of the hull HobbyBoss includes clear styrene skirts so you can do so! While construction is complex most assemblies are simple if repetitious and even the folding headlights can be made to operate if care is taken with their etched brass mounts. Two styles of driver-mechanic’s hatches are included and installed in Step 4. While the kit shows you attaching the fenders as well, it may be wise to wait until after the tracks are fitted in Step 6/7. Nothing is attached to the fenders until later anyway. Likewise, in Step 8 the fan shroud (Part H13, clear or green) may be permitted to open if care is taken with the etched brass hinges. The rest of the construction of the model is pretty familiar for armor builders. Turret assembly starts in Step 10 with the machine gun turrets (choice of ball mount faces) and the main turret has a cleverly done KT-28 gun with built-in hinge; anyone having done the ICM T-28 or T-35 knows it takes a great deal of work to get a good fit and any sort of movement with their gun. The mantlet may also be fitted with the “combat lights” but these need wires to go down into the tank from the rear of the enclosures. This kit comes with an improved rail antenna and that is fitted in Step 13. The 45mm turrets follow in Step 14. Note that other than the DT machine guns there is ZERO interior in all five of the turrets. The kit comes with nicely done four-piece jacks and also etched brass access ladders for the sides of the hull. Two finishing options are provided: one with red stars and twin white stripes on the side of the turret, and one with full late 1930s markings - red stripe, dashed white stripe, and white square with red stars. While not shown the cast star on the turret roof may or may not have been painted, but no decal is provided in the kit for that marking. Overall, even with the addition of etched brass this is an easier kit to assemble than the ICM one and much better detailed.